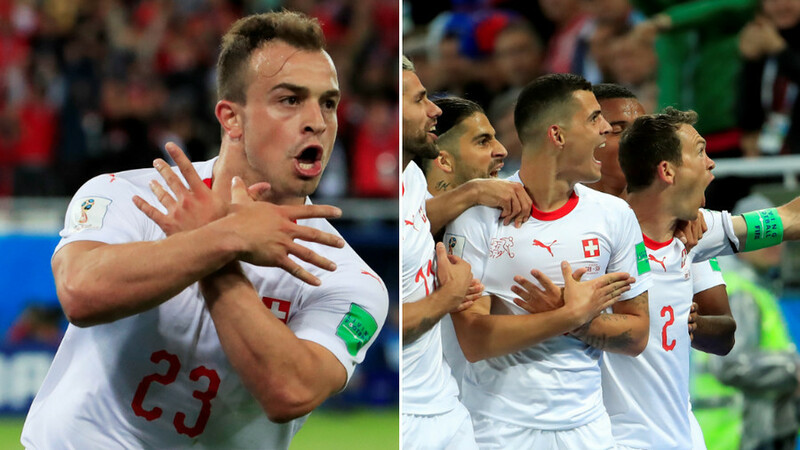 Switzerland’s World Cup win over Serbia in Kaliningrad has been overshadowed by celebrations made by the two Swiss goalscorers, Granit Xhaka and Xherdan Shaqiri, both of whom are of ethnic Albanian descent. Xhaka struck the Swiss equalizer in the 52nd minute before Shaqiri scored a late winner when he broke free from the half-way line to slot past Serbian goalkeeper Vladimir Stojkovic, handing Switzerland a 2-1 victory. Shaqiri also played in boots marked with the flags of Switzerland and Kosovo – the breakaway region that is not recognized as independent by dozens of countries, including Serbia and Russia. Will FIFA take action against #SWI players doing political celebrations? No. What a goal from Xhaka. Had been criticised for not doing enough in first game by Swiss media. Not sure the double eagle celebration was a wise move v Serbia however. Let's see how FIFA's "keep politics out of sport" thing goes in the coming days. lol. Swiss coach and player don't want to talk about the Albanian symbols. Reporter: "We cannot gloss over this! The entire world has seen it!" The result moves Switzerland to four points in World Cup Group E, level with Brazil, while Serbia are one point behind. An incredibly tight finale sees Serbia take on Brazil in Moscow on Wednesday, while Switzerland play a Costa Rica team that already have no hope of making the knockout stages.